Hundreds came together for a colourful event this weekend celebrating cherished memories of their loved ones. 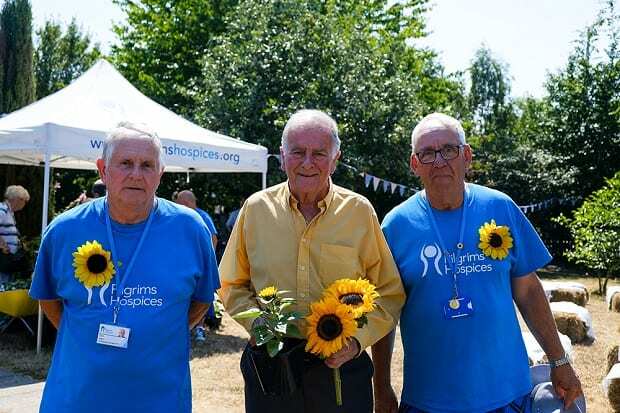 Around 900 people attended Pilgrims Hospices Sunflower Memory gatherings to see beautiful sunflower plaque displays in the charity’s Canterbury, Ashford and Margate Hospice grounds. The sun was shining and there was a lovely atmosphere at each event with the opportunity for people to remember and celebrate their loved ones lives. This was Pilgrims fifth annual Sunflower appeal and the biggest yet, and by far the hottest! With the temperature soaring into the high 20’s, visitors shared special memories with the Pilgrims team within the tranquil gardens, while enjoying cool drinks, tea and cake. So far the event has raised an amazing £26,500 but with extra donations and Gift Aid, the total should reach £30,000 for the three events. The amazing figure will support hundreds of people living with an incurable illness in east Kent, with donations continuing to come in. Each event was supported by Pilgrims volunteers helping with refreshments, merchandise and selling sunflower plants as well as welcoming people, helping supporters find their sunflowers plaques, and being there for people putting memories on the memory wall. The summer appeal plays an extremely important role in Pilgrims’ campaign to support as many people as possible. The sunflower memory markers will remain in the grounds of the three Pilgrims Hospices in Ashford, Canterbury and Thanet over the coming two weeks with visitors welcome to view them. If you still wish to take part, Pilgrims will continue to accept contributions until mid August via www.pilgrimshospices.org/sunflower, the Pilgrims team on 01227 782062 or by visiting your local Pilgrims Hospice reception. 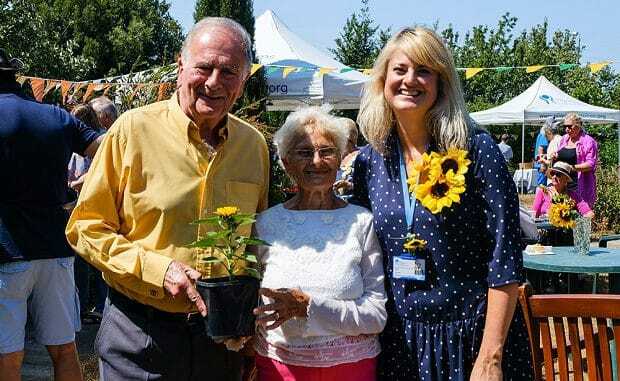 Thank you to the Westerleigh Group for their continued annual sponsorship of the appeal, Broadstairs Garden Centre, Hythe Garden Landscapes, Meadow Grange Nursery, Vincent Nurseries, Victoriana Nurseries, Maytree Nurseries and Maytree Nurseries for donating seeds, pots and compost for our volunteers to grow 300 sunflowers. Each year Pilgrims supports hundreds of local people coping with a life limiting illness and their families. The charity offers a range of services: from end of life care given on its wards, to its new wellbeing and social programme supporting people after they are diagnosed to live well and stay independent. The club was delighted to present Birchington C of E Primary School with a trophy to celebrate the children’s Citizenship. The award is to recognise the pupils’ understanding of community responsibility and to promote the school’s core values of Respect, Equality, Forgiveness and Peace. 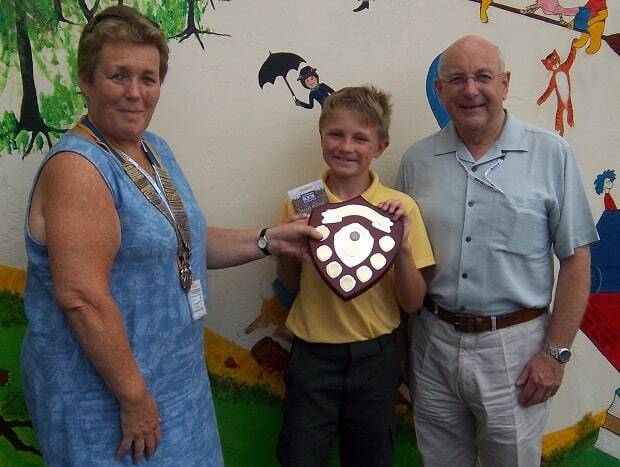 The first winner of the trophy was Logan Prescott and the photo shows President Loraine and President-Elect Chris presenting the trophy and gift voucher to Logan. The school has decided to build a “Peace Spiral” garden where children and staff may go to spend quiet time in contemplation, thought and prayer. Members of the Rotary Club are preparing the plot ready for the construction of the Peace Spiral and the school is currently raising funds so that the materials can be bought. Recently, the Rotary Club hosted a visit by Rotarians from our “contact club” in Darmstadt, Germany and their President, Michael Schaefer, very kindly donated £250 to be used for a community project and the peace spiral fits the bill perfectly. 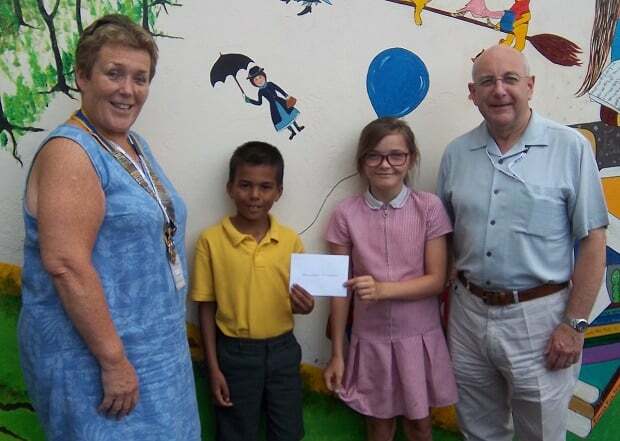 The photo shows President Loraine and President-Elect Chris presenting the cheque for £250 to the school’s “Spirituality Reps” Gracie Hopkins-Dell and Leo Konetti. The club was also delighted to present St Crispin’s School, Westgate-on-Sea with a trophy to celebrate the children’s creativity. This award is to recognise excellence right across the fields of creativity from dance to music to art. Children from every class were chosen as winners for their creative efforts and, from those winners, an overall Creativity Champion was chosen. 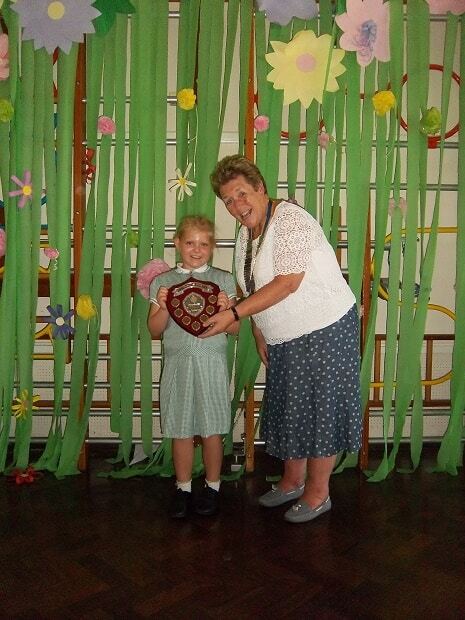 Rotary President, Loraine Bant, is shown presenting the trophy for the first time to Phoebe Cooper. 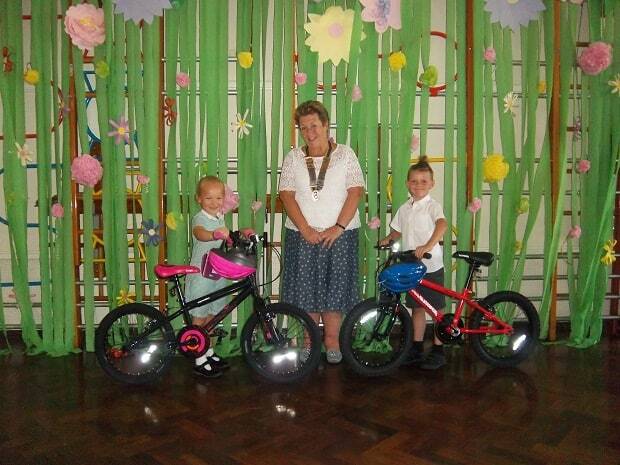 The school also made presentations of certificates to a large number of children who had achieved 100% attendance this year and the Rotary Club helped to finance two bicycles which were presented to Aimee-Eloise Grant and George Jeavons-Fellows by President Loraine. The club is holding an afternoon tea party at Crampton Social Hall, The Broadway , Broadstairs. It takes place on Tuesday, July 31 from 2pm to 4pm. Sponsored by Tesco’s and Crusties Bakery. To find out more contact Gail on 07940 733430. Margate Baptist Church was the setting for the latest meeting of the Thanet Over Fifties Forum (TOFFs) which took place on Wednesday 18 July. 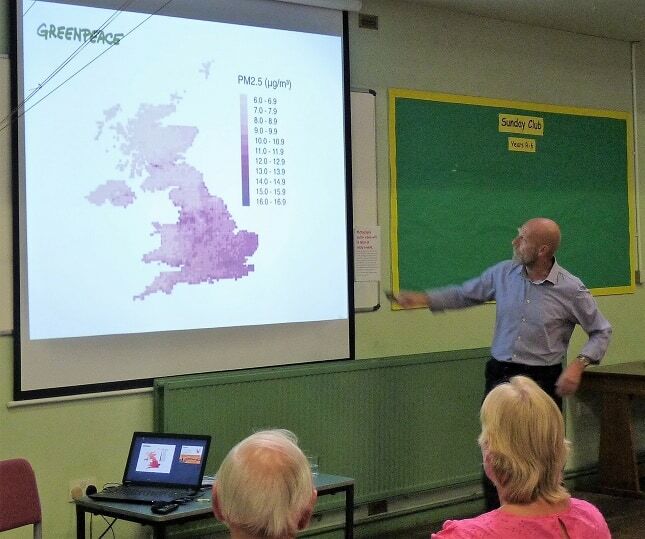 John Halladay of Greenpeace, and Jasmin Vickers of Thanet Coast Project, were the two guest speakers, as the Environment took centre stage at this packed meeting. He also shared news from around the world (good and bad), including the incredible discovery of million-strong penguin colonies found in a remote part of the Antarctic, which, he said, highlighted the need to protect the Antarctic and its abundance of wildlife more than ever. 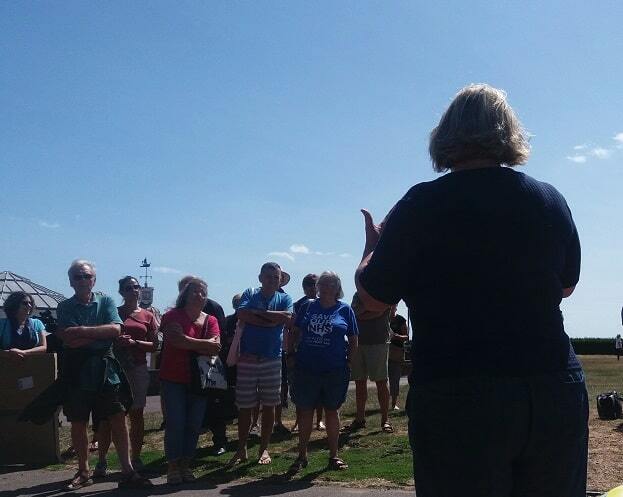 Jasmin Vickers (Thanet Coast Project) then spoke passionately about Thanet’s spectacular coastline, and its importance, internationally, for wintering birds and diverse marine life associated with the chalk cliffs, caves, reefs and sandy bays. It was news to many present, that the Thanet coast had the second-longest unbroken chalk reef in the whole of the UK and one of the longest in Europe. Our rock pools, chalk reefs, caves and marine life form part of the designated conservation area known as the North East Kent Marine Protected Area (NEKMPA), which is deemed a Site of Special Scientific Interest (SSSI) and is protected by law. Jasmin also pointed out that the project relies on volunteers to help safeguard the coastal environment locally, including its marine and bird life. A particularly rewarding way to lend a hand is as a Warden or Guardian – who help by surveying wildlife and coastal activities and incidents once a month, which helps to shape the direction of the Project. Full training is given and it is a great opportunity to become the “eyes and ears” of your chosen area of coastline. 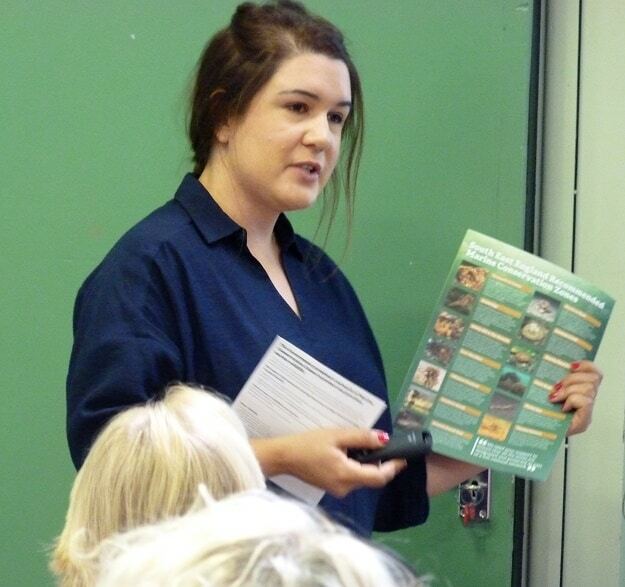 TOFFs co-ordinator Pauline Petitt said: “Our guest speakers and those who attended the meeting showed what TOFFs is all about – bringing information and promoting discussion on topics of interest as chosen by our members”. To discover more about both speakers’ projects, and to join the ever-growing army of TOFFs members for free, contact Pauline on (01843) 609337 or toffs@thanetvolunteerbureau.co.uk. As a follow-on from the meeting, next up for TOFFs is the screening, in partnership with Broadstairs Town Team, of Sir David Attenborough’s powerful documentary, A Plastic Ocean, at the Palace Cinema, Broadstairs, on Thursday 30 August at 6pm. To find out about booking tickets, contact Pauline via the details above. Saturday, October 6 from 2.30pm-8.30pm. Sign up your teams and come along to a fun-packed day, supporting charities and our community. It is called the 50/50 because half of what you raise can go to the charity of your choice or you can donate all to the Rotary nominated charities. Foreland Fields School in Ramsgate welcomed visitors from isle businesses and groups this week to celebrate the first year of an initiative to give pupils a voice about their future. The project, which was set up by learning disability charity East Kent Mencap, aims to raise young peoples’ confidence through discussions about their rights and presentations from local groups. The group of sixth formers, who all have a learning disability, meet every two months and have already enjoyed talking to representatives from Tesco, Pathways, and Kent County Council. Michelle Hosken from East Kent Mencap organises the events as part of KCC’s Valuing People Now initiative. Sixth-Former Poppy said the course had helped her think about her career and she would like to explore becoming a makeup artist. The project is keen to make contact with local businesses and organisations who would be willing to come along to the group to talk to pupils about career opportunities. Anyone interested is invited to contact Michelle Hosken on 07577 681 783. 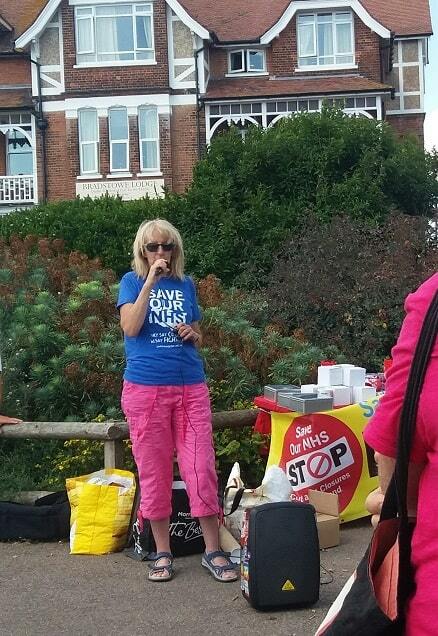 A protest against the closure of GP surgeries in Thanet, east Kent, was held in Broadstairs by the Save Our NHS In Kent (SONIK) campaign group on Saturday (28 July). Members of the public were invited to give their views and speakers demanded an assurance that no more surgeries would be closed. SONIK campaigners believe there’s a danger that Thanet surgeries will be allowed to close and replaced with out-of-town medical centres called “super hubs”. The spokesperson said: “They say these super hubs will have extra facilities and will be able to provide a higher standard of medical care. In reality we believe they are just a very poor way of trying to cope with the chronic shortage of doctors. In fact we need more doctors in the community, near their patients, and not in out of town super hubs. “The super hub approach is particularly unsuited to Thanet where car ownership is low and we have a high proportion of elderly, poor and vulnerable patients. These are exactly the kinds of people who need continuous care from the same doctor — in other words local GPs. The campaigners also expressed concern that services at Margate’s QEQM hospital might be reduced at the same time as the super hubs are introduced. Dr Jihad Malasi, chair of NHS Thanet Clinical Commissioning Group, said: “Our ambition is to make an amazing, positive, life-changing improvement to people’s health in Thanet. “People have asked for one-stop shops where they can access health services, see their social worker, get help to stop smoking or lose weight, see a counsellor, get advice on housing and employment and all sorts of things that would make life easier. We know these would also help us provide more joined up care. “Other areas have shown that working in this innovative way has huge benefits for patients, their families and the wider community and makes it much easier to attract new GPs, nurses and other staff – and that’s what we want for Thanet. “We are working towards creating one of these new health and care hubs at Bethesda Medical Centre in Margate, and will be asking people what services should be in it, so they can help shape it. “Over the next few years, we aspire to create similar centres in Broadstairs, and in Ramsgate. There are no guarantees we will succeed, though we will do our very best. NHS bosses say of Thanet’s 14 GP practices, only Northdown Surgery and Bethesda Medical Centre in Margate aspire to merge. They have not yet applied to do so. To get approval, they will have to consult with patients, and satisfy the CCG that there are good arrangements in place for all patients.